Port Blair, 30 April : Andaman and Nicobar Police today confirmed that the twenty five years old girl of United State of America, who was missing since Wednesday, was actually attacked by Crocodile. Lauren Elizabeth Failla of USA was missing from Neil Cove beach of Andaman’s Havelock Island since late afternoon of Wednesday. Elizabeth’s friend Ajit Singh Chadda, an US citizen had reported the incident to police on Wednesday. “We have recovered the underwater video camera of Elizabeth’s friend, which shows that the lady was attacked by a crocodile,” a senior Police officer told ‘Andaman Sheekha’, who does not want his name to be quoted. However even after more than 48 hour search the body of US tourists, could not be recovered from Andaman Sea. 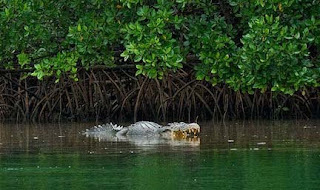 “We have however located the crocodile near the Light House of Havelock Island but could not locate the body yet. The search operation is still on,” the police officer added. This incident has left the local population of Andaman Islands and the entire Andaman Tourism Industry shocked. 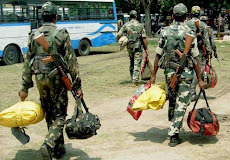 Agartala, 30 April : Indian government has begun withdrawing central paramilitary forces from the North-East for deployment in Maoist-hit areas, a top Tripura police official said today. The Centre is in the process of withdrawing six companies of CRPF from Tripura, Manipur and Assam for deployment in Maoist-hit areas, Director General of Police Pranay Sahaya said. 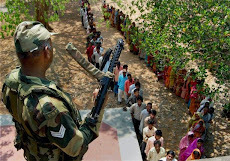 He said that due to shortage of the paramilitary forces, the Union Ministry of Home Affairs has sanctioned only 12 companies against the state's requirement of 30 companies, for the May three Tripura Tribal Areas Autonomous District Council elections. 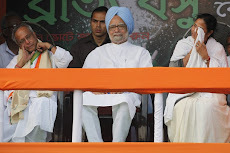 PTI, Kolkata, 30 April : Four district Congress chiefs began an indefinite fast this afternoon demanding an "honourable alliance" with the Trinamool Congress for the 30 May civic polls in the state, but withdrew it at night after being assured by the leadership that the party would not go for any undignified alliance with the Trinamool Congress. "I sat with them for talks and told them that nothing will be done that will bring indignity to the party. The alliance will only be on honourable terms, otherwise there will be no alliance," WBPCC working president Pradip Bhattacharya told PTI. 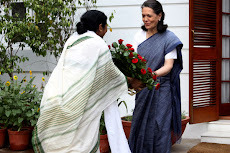 Kolkata, 30 April : An inquiry committee probing the Maoist attack at the Eastern Frontier Rifles camp at Silda in West Midnapore district which left 24 EFR jawans dead today submitted its report to the West Bengal government. The three-member committee was set up to fix responsibility on lapses during the February 15 attack, its causes and also to suggest measures to prevent such incidents. 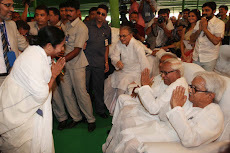 The committee, headed by former home secretary and new Chief Secretary Ardhendu Sen, submitted the report, which was later placed before Chief Minister Buddhadeb Bhattacharjee. Sen later told reporters that the detailed report containing about 12 or 13 recommendations were discussed with Bhattacharjee, who would review it in detail. Sen declined to divulge details of the report on the attack. PTI, New Delhi, 30 April : Government today apprised MPs belonging to 33 worst Naxal-affected districts about its strategy, especially development schemes, and sought their cooperation in the task to deal with the Naxalites. Home Minister P Chidambaram and other top officials briefed the MPs about the gravity of the Naxal problem and steps being taken by government to deal with the menace. 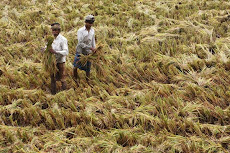 "Planning Commission had given a presentation to the MPs about development schemes. Focus is entirely on flagship programmes of Government of India as implemented in the districts," Union Home Secretary, Gopal K Pillai, told reporters after the nearly two-hour long meeting. 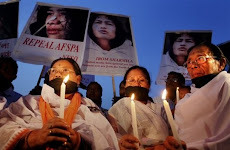 PTI, Guwahati, 30 April : A top leader of a Manipur-based insurgent group was arrested here late tonight along with his associate, police sources said. K H Tomba, Vice Chairman of United National Liberation Front, was apprehended along with his associate Abu Singh by a Special Investigation Team of Assam Police at Lakhra Patharquary locality at around 2245 hours, they said. Tomba is wanted in connection with a number of cases of murder, kidnapping and extortion, the sources said. Guwahati, 29 April : The famed Kaziranga National Park in Assam has the highest density of tigers in the world at 32 per 100 sq km, surpassing the Corbett National Park’s record, it was announced Thursday. “I am proud to state that Kaziranga National Park has the highest density of tigers compared to any known tiger habitats in the world,” Assam Forest Minister Rockybul Hussain told journalists quoting a report conducted over three months by a team of experts. The study was conducted by Aaranyak, a society for biodiversity conservation in the northeast, and the Assam Forest department, using the ‘camera trap’ method of tiger estimation. 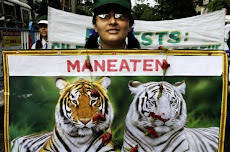 “The study carried between January and March 2009 covered an area of 144 sq km and revealed there are 32 tigers per 100 sq km area of the park,” the minister said. The 430 sq km park, 220 km east of Assam’s main city Guwahati, is home to the world’s largest concentration of the one-horned rhinoceros. As per the 2009 census report, 2,048 of the world’s estimated 3,000 one-horned rhinos lumber around the swamps and grasslands of Kaziranga, their concentration here ironically making the giant mammals a favourite target of poachers. “In all, 39 individual tigers, including a one-year-old cub, were photographed during the photo-trapping exercise, although using a scientific method called capture recapture, it is estimated there are 47 tigers in the study area of 144 sq km,” Hussain said. Corbett National Park earlier held the record for the highest density of the big cats at 19.6 tigers per 100 sq km. The study was funded by the David Shepherd Wildlife Foundation and the Rufford Small Grants Foundation, Britain. 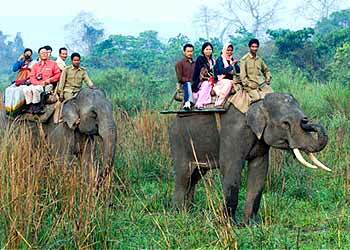 “Adequate conservation measures by dedicated team have helped Kaziranga achieve such a milestone,” the minister said. UNB, Thimphu, 29 April : The 16th SAARCsummit ended on Thursday with the adoption of a statement called Thimphu Statement on Climate Change, expressing a determination to make South Asia a world leader in low-carbon technologies and renewable energy. The statement, adopted on the concluding day of the summit, emphasized the importance of reducing dependence on high-carbon technologies for economic growth, and that promotion of climate resilience will promote both development and poverty eradication in a sustainable manner. The separate statement was issued as Climate Change was designated as the key theme of the 16th SAARC Summit, in the wake of the vulnerability faced by member states from global warming. Expressing deep concern over the adverse effects of climate change, the statement called for the commissioning of a SAARC Inter-governmental Climate-related Disasters Initiative, on the integration of Climate Change Adaptation with Disaster Risk Reduction. The statement said the SAARC member states face the dual challenge of addressing the negative impacts of climate change and pursuing socio-economic development. 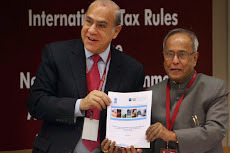 It noted that South Asia is especially prone to the ill-effects of climate change and related disasters, making the need for a regional response to meet the challenge more urgent and compelling. It said South Asia could benefit from cooperative regional initiatives and exchange of knowledge, as well as transfer of technologies to address the challenges. It recognizes that the preservation of the environment and mitigating the impacts of climate change are mutually reinforcing. The Thimpu Statement on Climate Change also agreed to review the implementation of the Dhaka Declaration and SAARC Action Plan on Climate Change, with a view to ensuring its timely implementation. The SAARC leaders agreed to establish an Inter-governmental Expert Group on Climate Change to develop clear policy directions for regional cooperation as envisaged in the SAARC Plan of Action on Climate Change. 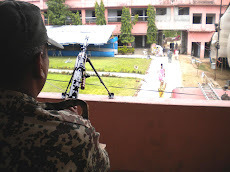 Jhargram, 29 April : Security has been beefed up in West Midnapore district following intelligence reports that Maoists could launch another Shilda-type attack soon. An intelligence report submitted to the state government last Tuesday has warned of the possibility, top police sources said. Aimed at shoring up battered morale of Maoists in the face of consistent anti-Naxal operation, the attack is likely to be led by Maoist leader Kishenji's brother Venugopal Rao who has entered forested regions of West Midnapore, Bankura and Purulia districts, collectively known as Jangalmahal, the report said. IANS, Guwahati, 29 April : Militants on Thursday lobbed grenades on police in Assam's North Cachar Hills district but there were no casualties, police said. All the attacks took place in Haflong, the district headquarters. Two grenades were lobbed at a police station while another was hurled at a police team patrolling near a school. "There were no casualties. All the grenades missed their targets," a police official said. The identity of the attackers was not immediately known. 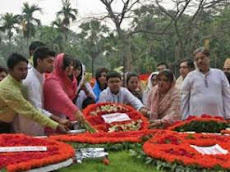 Dhaka, 29 April : The Special Court-6 on Thursday fixed 22 November for hearing on charge framing against the 256 mutineers of the Bangladesh Rifles Pilkhana hospital unit. 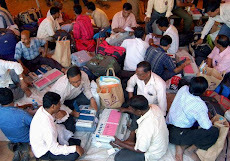 In the morning, the 256 mutineers were produced before the court set up at the Darbar Hall in BDR Pilkhana headquarters. During his submission, prosecutor of the case Lt Col Dr SMA Al-Muid gave an elaborate description of the offences of BDR jawans before the court. Of the accused, 84 mutineers, including JCO (Junior Commanding Officer) medical assistant Subedar Major Hafizuddin, were present at the Darbar Hall during the 25 February mutiny and they took part in the carnage defying the order of then director general Maj Gen Shakil Ahmed, he said. 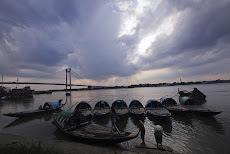 Agartala, 29 April : Five people, including two children, were killed and 11 injured in lightning strikes in different parts of Tripura, officials said Thursday. Eight-year-old Rajiv Bhoumij and his six-year-old sister Sunimalal died on the spot and their parents suffered burns in the incident in west Tripura district's Bishalgarh block Wednesday night. 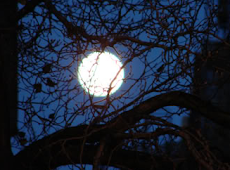 The family was sleeping when lightning struck, an official said. 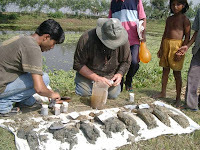 Besides, a woman was killed in Teliamura in west Tripura and two youths died in Kanchanpur in north Tripura. Nine more people were injured in these incidents. 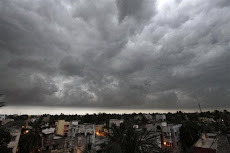 Lightning and thunder, accompanied by high velocity winds, have lashed Tripura over the past several days, damaging crops and uprooting electric poles and trees. Kolkata, 29 April : Bangladesh Prime Minister Sheikh Hasina Wazed, noted Rabindrasangeet singer Suchitra Mitra and renowned scientist Prof Yash Pal are among the 24 people to be awarded by the Asiatic Society here on 3 May for their rich contributions in respective fields. 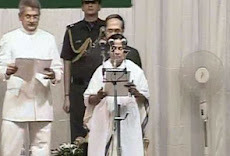 Informing this, Asiatic Society sources today said the annual awards of the three hundred-year-old renowned educational and research institute would be handed over to the recipients at a colourful function here by West Bengal Governor MK Narayanan after the Society's 226th Annual General Meeting next Monday. 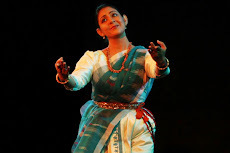 Besides the Bangladeshi Prime Minister, Suchitra Mitra and Prof Pal, other eminent personalities who have been selected for the prestigious awards include president of Bangladesh Asiatic Society Professor Sirajul Islam, Deputy Director General of Indian Council for Agricultural Research Professor Swapan Kumar Dutta, noted Geologist C Leelanandam, noted neurologist Pritam Nasipuri, well-known social scientist Dileep Nachane, renowned Persian scholar Azarmi Dukht Safavi and well-known writer and journalist Nirendranath Chakraborty. 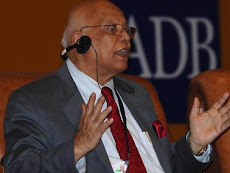 In addition, Dr Somendra Chandra Nandy would receive Honorary Fellowship of the Asiatic Society for his unmatched contribution to the field of history and historical studies, the sources informed. The award would comprise a shawl and a citation besides some cash prizes. 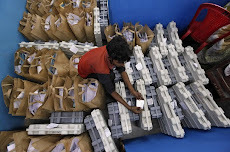 Agartala, 29 April : To ensure smooth conduct of the Tripura Tribal Areas Autonomous District Council (TTAADC) elections on 3 May, the 856-km long Indo-Bangla border would be sealed from tomorrow. 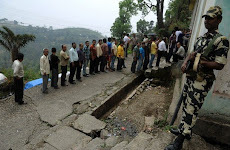 Prohibitory orders under section 144 CrPC would be clamped in the border areas of the four districts while the international boundary would be sealed as a precautionary measure to ensure elections to the 30-member tribal council went off peacefully, official sources said. The BSF has also been asked to keep tight vigil to ensure no unwanted element could cross over to the state from the neighbouring country. Dhaka, 29 April : A new animal has been added to the list of species in Bangladesh when a yellow-throated marten was spotted for the first time by a young banker in Lawachhera forest. The yellow-throated marten - a distant relative of civet, mongoose, badger and otter - was spotted by banker CM Reza about two kilometres inside the Lawachhera forest very early in the morning on 13 March. 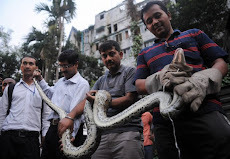 This beautiful animal in yellow and black coat was so far thought not to exist in Bangladesh. 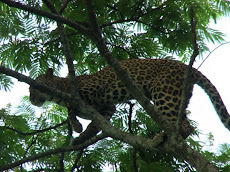 CM Reza spotted the marten on a 40 meter tall tree. It was searching for food and was in sight for about two minutes after which it hid in the forest. Largest among the Himalayan Martens, this yellow and black coated species is known to live in the Himalayas from below the tree line to 160 meters above the sea level. “So the Lawachhara population of the animal would represent the lowest elevation in its distributional range,” Dr Khan said. IUCN considers its world population as not in danger of extinction and as such categorized it as "Least Concerned", added Dr Reza. “But as it has so far been sighted only once in Bangladesh and that too in a small patch of forest 'island' encircled by heavily populated villages and tea estates, it must be considered as the most highly endangered or critically endangered Marten population,” Dr Rexa said. 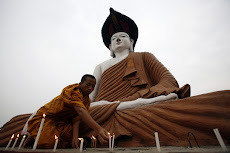 UNB, Thimpu, 28 April : The two-day long 16th SAARC Summit began on Wednesday in Thimphu, the capital of Bhutan, aiming to take united initiative to deal with climate change and boost trade for economic development of the region. 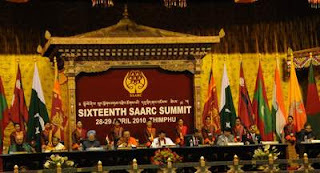 Earlier, the leaders of eight South Asian nations gathered in Thimphu to play their respective roles in the summit. The theme of the summit is ‘Conservation of Environment and Climate’ also with addressing other challenging issues like terrorism, poverty alleviation and regional cooperation, and further strengthen the economic integration of the South Asian countries. Leaders will figure out ways to address the threat of climate change as an integral part and pull millions of people out of abject poverty, combat terrorism and deal more effectively with the region's natural disasters. Thimpu is prepared to hold the summit of the South Asian Association for Regional Cooperation (SAARC) comprised of Afghanistan, Bangladesh, Bhutan, India, the Maldives, Nepal, Pakistan and Sri Lanka amid tight security. UNB, Thimpu, 28 April : Bangladesh Prime Minister Sheikh Hasina on Wednesday sought cooperation from all, including the United States, to combat terrorism, saying it is impossible to fight against terrorism alone. 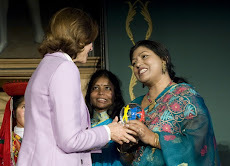 She sought the cooperation when US Assistant Secretary of State Robert Blake called on her at Bangladesh Villa in SAARC Village. The prime minister mentioned that terrorism has become a threat to peace and prosperity of the world, including the SAARC region. She underscored the need of united efforts of the SAARC member countries to free the region from terrorism and extremism. 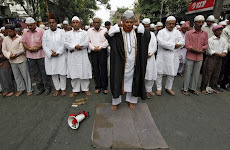 IANS, Guwahati, 28 April : A massive security alert was sounded in Assam Wednesday following intelligence reports of at least three bombers of the outlawed United Liberation Front of Asom (ULFA) sneaking into the state's main city of Guwahati to carry out serial explosions in public places. A police spokesperson said the ULFA bombers belonged to the outfit's 109th battalion and were aiming to trigger violent attacks in the city. 'They could target security forces and even crowded areas like Machkhowa, Ganeshguri, and Fancy Bazar, and we have already deployed security forces in strength to foil any such attacks,' Bibekananda Das, senior superintendent of police (in-charge) of Guwahati city, told journalists. BSS, Thimpu, 28 April : Bangladesh Prime Minister Sheikh Hasina on Wednesday said Nepal and Bhutan could generate more hydro-electricity by using their water resources and export to Bangladesh. The Himalayan state Nepal has ample opportunity to produce more hydro-electricity tanks to its geographical location, Hasina said when Nepal’s Prime Minister Madhav Kumar Nepal paid a call on her at Bangladesh House in SAARC Village in the morning. 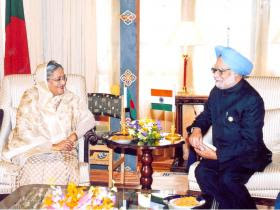 During the meeting, they discussed wide range of bilateral issues including expansion of trade and business between the two countries, establishing inter-country road connectivity and the possibility of using land and seaports of Bangladesh by Nepal for the economic benefit of both the countries. 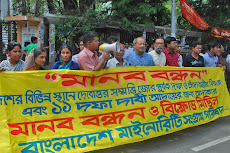 Dhaka, 28 April : Leaders of the Bangladesh Federal Union of Journalists (BFUJ) and Dhaka Journalists Union (DUJ) today protested the government’s decision to shut-down private satellite television operator Channel-1. They also urged the government to give an opportunity to the channel to resume its broadcast. The journalist leaders in a joint statement said the government shut-down the channel with a lame excuse and in this way it also barred freedom of expression and the right to hold independent views. 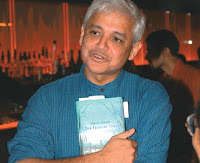 Noted author Amitav Ghosh wins prestigious "Dan David"
PTI, Jerusalem, 28 April : Noted Indian author Amitav Ghosh has won the prestigious Dan David Prize for his remarkable reworking of the great tradition of the Western novel in transnational terms. The one million dollar award is a joint international enterprise endowed by the Dan David Foundation and headquartered at Tel Aviv University. 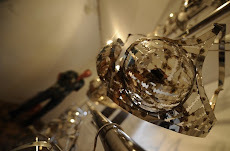 It is annually awarded in three different fields - Archaeology, Performing Arts and Material Science - in the three dimension time framework of past, present and future. Ghosh, 53 is the third Indian to win the award, joining an elite league comprising of chemist CNR Rao and musician Zubin Mehta. 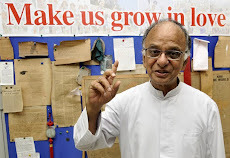 The Indian author will be sharing the prize in the present dimension with Dr Gordon E Moore, whose Moore's Law has become the guiding principle for the semiconductor industry to deliver ever-more-powerful chips while decreasing the cost of electronics. 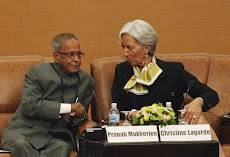 PTI, New Delhi, 28 April : Put off by the vociferous protests in the Lok Sabha by AIADMK members over 2G Spectrum allocation issue, an agitated Finance Minister Pranab Mukherjee today found it "disgusting" that some members were derailing the House. 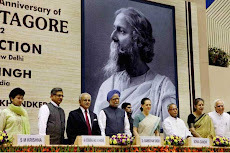 Faced with protests from AIADMK, which has nine members in the Lok Sabha, as well as some from other opposition parties, when he rose to present the Finance Bill, Mukherjee said, "Only ten members are holding a House of 543. This is not fair". This is "disgusting", he quipped. 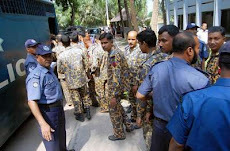 Dhaka, 28 April : The mutiny trial against 256 mutineers of hospital unit of Bangladesh Rifles Pilkhana Headquarters began on Wednesday, minutes after a case was filed before the Special Court-6 set up for trying the BDR mutiny case. The three-member court headed by BDR Director General Md Mainul Islam took the case into cognisance and asked the authorities concerned to produce all the mutineers before it at its next sitting. 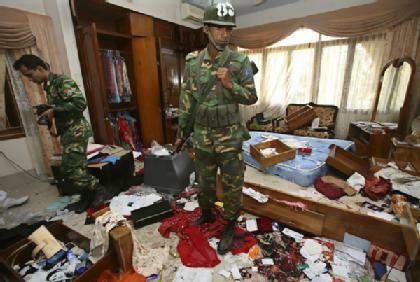 Subedar Nannu Miah of the unit filed the case for their alleged involvement with the mutiny. Of the 256 accused jawans, 90 have been detained in a case filed with the New Market Police Station in connection with BDR Pilkhana mutiny while the rest 166 are still serving the unit. The court also ordered to show the 90 arrested in the case and arrest the rest. 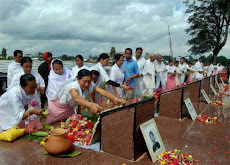 A total of 74 people, including 57 army officials, were killed during the 25-26 February mutiny at Pilkhana BDR Headquarters. 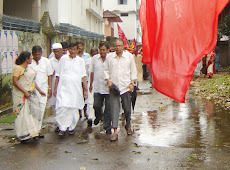 Jhargram, 28 April : A CPI(M) activist was killed by unidentified assailants near Jhargram in West Midnapore district in the wee hours today. Police said Nihar Mahato (35), an active member of CPI(M), was taken away by armed unidentified men from his house at Kamariya village under Jhargram police station area last night. 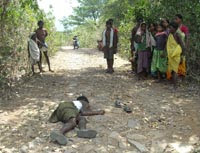 Mahato was then made to walk towards Chandi More, some distance away, with his hands tied and shot dead. The body, with two bullet wounds on head, was recovered this morning by the joint forces. 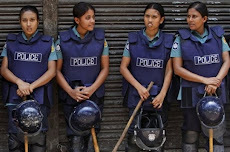 Dhaka, 28 April : At least 30 people were injured in an hour-long clash between riot police and garment workers in Dhaka's Mirpur area Wednesday morning. Vehicular movement in the area came to a halt for several hours following the incident. Chase and counter-chase took place between them, turning the Mirpur 13 and 14 sectors into a battlefield. 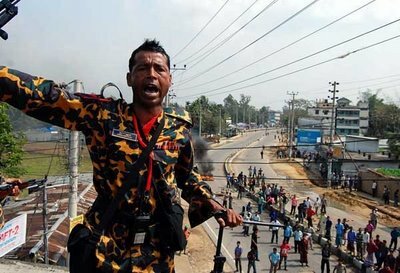 Witnesses said the clash developed as several hundreds of garment workers of different factories in Mirpur area including the workers of the Opex Group took to the street at about 9:30am(BDST) and blocked the road to press home their several demands including increasing their monthly salary minimum Tk 5000. 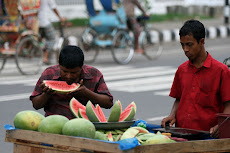 At present the workers get only Tk 1650 monthly. Kolkata, 28 April : A notice of closure has been served on a premier private hospital here and show cause issued to three government-run ones for "violating" the Bio-Medical Waste (Management and Handling) Rules, 1998. 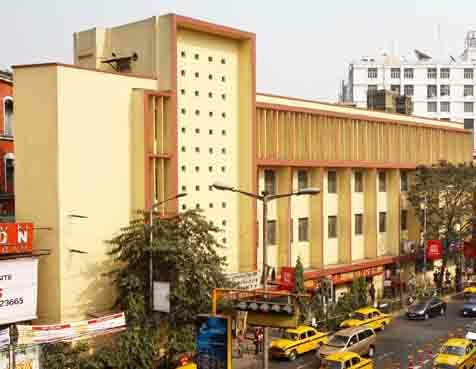 The Calcutta Medical Research Institute has been issued notice for closure and allowed a month's time to improve waste management by the West Bengal Pollution Control Board. A cost of Rs one lakh for repeated violation of the Board's orders was also imposed, a PCB spokesman said today. 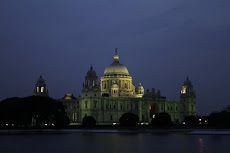 Also at fault were state-run Calcutta Medical College and Hospital, Howrah state General Hospital and Uluberia sub-divisional hospital. 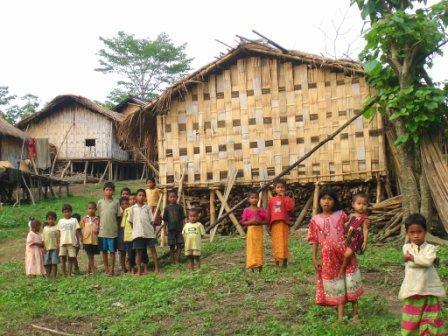 Dhaka, 28 April : Asian Development Bank (ADB) will not provide fund for any development project that threatens lives and livelihood of Adivasi people. International consultant and team leader of ADB Roger Plant said social assessment must be conducted in future before launching any development project involving Adivasi people. 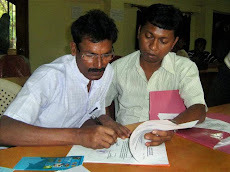 If it is proved that any development project is likely to have adverse impact on Adivasi people, ADB would not give any fund for it, he added. 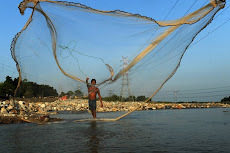 Roger made the comment at a discussion titled “Capacity development issues on indigenous people's safeguard and indigenous people's network forum in Bangladesh” following criticism from Adivasi participants regarding ADB funding on different development projects that affect their lives. Bangladesh Adivasi Forum (BAF) organised the programme in cooperation with ADB at IDB Bhaban yesterday morning. Roger made the comment with reference to ADB safeguard policy-2009. “Participation of Adivasi people must be ensured in a development project beginning from the stage of designing to monitoring. 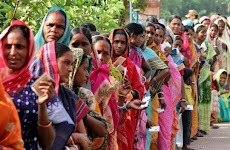 The development should be done respecting the culture of Adivasi communities,” said BAF general secretary Sanjib Drong. 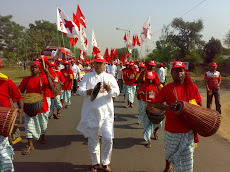 “Policy and law regarding Adivasi people should be formulated in a way that not only ensures protection of indigenous people but also benefits the marginalised indigenous community in the country,” he added. 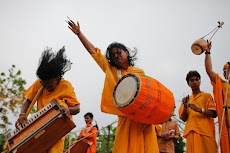 Adivasi participants mentioned instances of projects like the ones in Fulbari and Madhupur National Park that affected indigenous people severely displacing them from their own land. The ADB policy ensures culturally appropriate social and economic benefits for adivasi people in its future projects and their active participation in all levels of a project including its design and implementation. 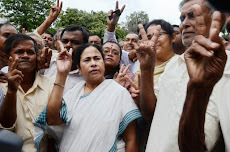 Kolkata, 27 April : Air and rail services were hit and normal life disrupted in the city and elsewhere in West Bengal as the 12-hour nationwide strike called by Left and some other non-BJP opposition parties to protest Centre's "failure" to check price rise got underway. Two train passengers were injured as a clash broke out between the passengers of Ganga Sagar Express and bandh supporters at Pandua station in Hoogly district this morning. 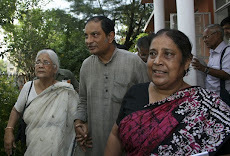 Abdul Razzak and Shanti Devi were injured when they along with other passengers tried to stop bandh supporters from stopping the train and putting up a banner. 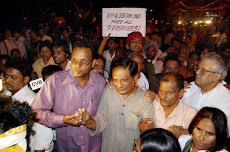 The bandh shut businesses and disrupted transport services by road, rail and flight operations. Metro railways spokesperson said their services were normal. Dhaka, 27 April : Bangladesh's Private television Channel 1 went off-air after regulators stopped its transmission for using rented broadcasting equipment in violation of the law. A three-member team of Bangladesh Telecommunications Regulatory Commission went to Channel 1 office on Uday Tower in Gulshan at 6:30pm(BDST) and switched off its transmission. The channel was broadcasting its 6:30pm news bulletin. The BTRC said Channel 1 had sold off its broadcasting equipment and has been using machinery owned by another company. 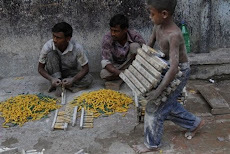 "But as per law, the licensee must own the equipment," said Post and Telecommunications Minister Rajiuddin Ahmed Raju. The government cannot tolerate such unlawful activities, he told journalists at the secretariat. UNB, Dhaka, 27 April : Bangladesh Foreign Minister Dr Dipu Moni has stressed the need for demand-driven and time-bound regional and sub-regional development projects, rationalization of the SAFTA sensitive lists and dismantling of non-tariff and para-tariff barriers for balanced development of the South Asian nations. The Foreign Minister emphasized this when addressing the 32nd session of the SAARC Council of Ministers in Thimpu, the capital city of Bhutan, said a Foreign Ministry press release. 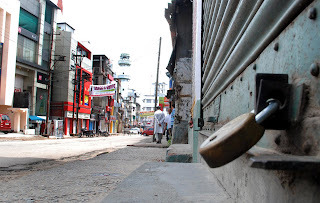 Agartala, 27 April : A 12-hour shutdown called by the Left-led 13 party front demanding immediate control on spiralling prices; roll back in customs duty on crude oil and excise tax on petroleum products paralysed normal life across Tripura and some North East states on Tuesday. None of the offices in Tripura registered any attendance. 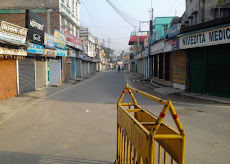 Shops and markets were closed and vehicles did not ply on the roads in Agartala. 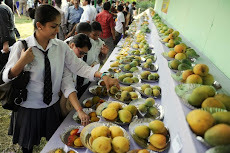 Schools and colleges were closed and Tripura University cancelled the examinations scheduled today. No untoward incident was, however, registered in any of the police stations. IANS, Kolkata, 27 April : Maoists blew up a foot of rail track in West Midnapore district, disrupting train services on day two of their shutdown in three states. The incident occurred early in the day between Midnapore and Bhadutala stations when a pilot engine that precedes the Chakradharpur Passenger was crossing the spot. The engine driver felt the shock but there was no damage, Additional Director General (Railways) Dilip Mitra told IANS. 'There was a crack of one foot. 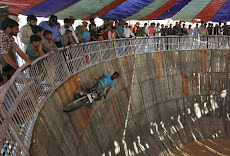 The police, paramilitary forces and bomb squad personnel were rushed and the track was repaired,' he said. 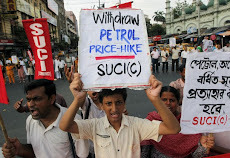 Guwahati, 27 April : Normal life was paralysed today in Assam during the 12-hour nation-wide strike called by the Left-led 13-party front to protest against price rise. There was no report of any untoward incident from any part of the state but shops, business establishments, schools and other educational institutions remained closed, official sources said. Attendance in the state secretariat and other government offices was thin, they said. Vehicles remained off the roads with long-distance buses and city service buses not plying. PTI, New Delhi, 27 April : Actor Shahrukh Khan and his wife Gauri, who promote IPL franchise 'Kolkata Kinght Riders', and Jaipur IPL Cricket that promotes 'Rajasthan Royals' have been issued show-cause notices for alleged violation of the Companies Act. "After expiry of notice period, criminal proceedings will be filed against the companies and the directors," the Registrar of Companies (RoC), Mumbai, informed the Ministry of Company Affairs. 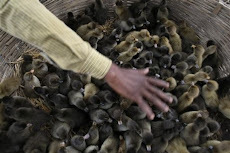 UNB, Chittagong, 27 April : Bangladesh Coast Guard in a drive on Tuesday afternoon arrested 44 pirates from the mouth of Swandip channel in the Bay of Bengal. Officials said Narayanganj bound lighter vessel MV Shyamol loaded with 5,300 metric tons of sugar from Chittagong was caught in the storm and aground in a char and remained stranded since Thursday. On Monday, two salvage vessels went to the char to unload the sugar and rescue the vessel. When returning after loading the sugar, a gang of armed pirates attacked the sugar loaded vessel and took the crews hostage. On information, coast guards rushed to the spot today and encircled the pirates. Sensing trouble the pirates opened fire at coast guards triggering a gun fight. Failing to face up the coast guards, the pirates at one stage retreated. After a hot chase coast guards managed to hold 44 pirates and rescued the crews with the sugar loaded vessel at 4pm. 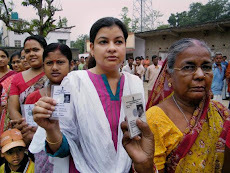 Agartala, 26 April : The 2011 Census officially started in Tripura on Monday, with the details of state Chief Minister Manik Sarkar and his wife, Panchali Bhattacharjee, being recorded by officials. 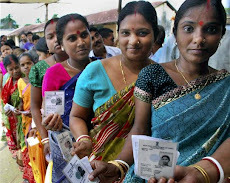 'An estimated 10,000 enumerators and supervisors have been appointed to visit every household in urban, rural and interior areas in Tripura to carry out the task of door-to-door headcount for the National Register of Indian Citizens (NRIC),' Deputy Director General of Census Operations S.K. Chakraborty told reporters here. UNB, Dhaka, 26 April : Bangladesh government today signed contracts with foreign EPC contractors to set up 5 peaking power plants in the public sector. The power plant projects are Bera 70 MW, Hathazari 100MW, Dohazari 100MW, Gopalganj 100MW and Faridpur 50MW. Peaking plants means these plants will be run during the peak hours from 4 pm to 11 pm when demand for electricity is excessively high. Furnace oil will be used to run the plants because of the gas crisis. Per kilowatt hour (per unit) electricity production cost at the plants will be between Tk 8-12 while the present average production cost is Tk 2. As per the contracts, the EPC contractors will complete the supply, install and commission of the plants within 15 months from the signing of the contracts on turnkey basis. This means the plants are expected to come into operation by August 2011. The state-owned Power Development Board (PDB) will implement the projects with funds from the public exchequer. PDB secretary Md. Azizul Islam signed the contracts with the representatives of the contract winning companies at a function at the DPDC head office in the city. 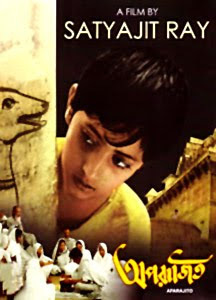 Dhaka, 26 April : Bangladesh Prime Minister Sheikh Hasina on Monday asked the commerce ministry to repeal the decision to withdraw a ban on import and display of Indian films in cinema halls. A minister revealed it to Daily Star seeking anonymity, emerging from a cabinet meeting at the Cabinet Division of the Bangladesh Secretariat. The prime minister also expressed her dissatisfaction over the decision regarding to the ban slapped in 1972, the source added. The commerce ministry recently lifted the embargo in a bid to inject a momentum into the country's waning cinema industry. 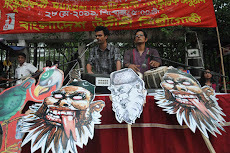 Dhaka, 26 April : Bangladeshi cinema producers and artistes on Monday staged a demonstration on the FDC premises in the capital demanding cancellation of the government’s decision to withdraw ban on import and display of Indian films in cinema halls. 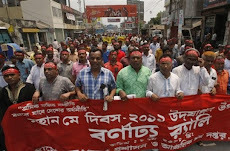 The industry people under the banner Bangladesh Chalachitra Oyko Parishad staged the demonstration on the premises of the Film Development Corporation (FDC), which continued for over 15 minutes. 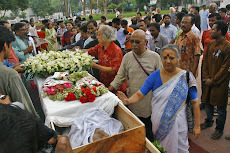 Eminent actors and actresses, including Razzak, Shahnoor, Anwara, Mizu Ahmed, and film director Mohammad Hannan participated in the demonstration. 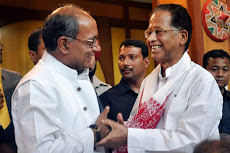 Kokrajhar (Assam), 26 April : Assam Chief Minister Tarun Gogoi today asked militant outfits in the state to shun violence and come forward for talks. "No problem can be solved through weapons. 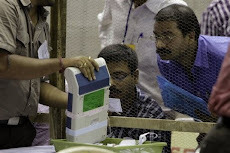 The militants must realise this and return to the democratic process," Gogoi told reporters here today. 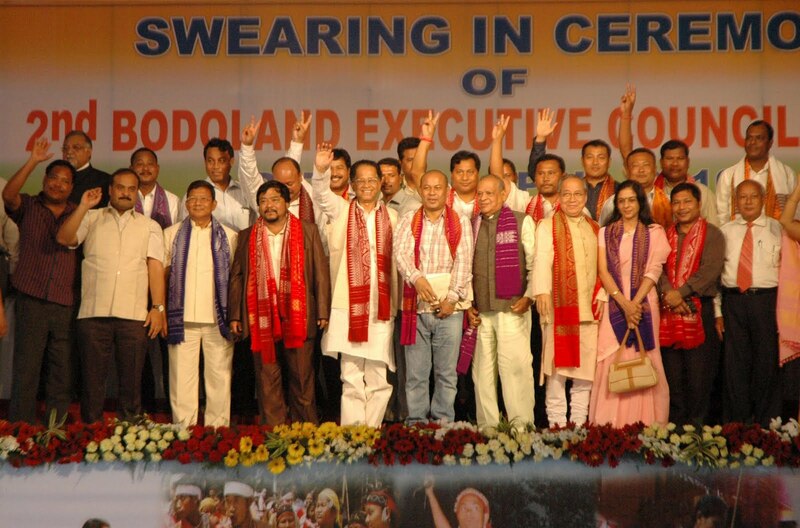 Citing example of Bodoland Peoples Forum leader Hagrama Mohilary, the chief minister said, "Mohilary was a member of militant outfit, but he came forward for talks and the Bodoland Territorial Council was formed." 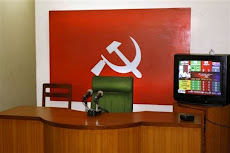 Jhargram, 26 April : A CPI(M), supporter was killed and another seriously injured by Maoists in Lalgarh area of West Midnapore district, police said on Monday. Armed Maoists late Sunday night entered Bammal village in Lalgarh area and forcibly took away Aditya Lohar (50) and Mihir Singh, both CPI(M) supporters, from their home, they said. The bullet-riddled body of Lohar was found in the outskirts of the village while Singh was found in a seriously injured condition this morning, they said, adding Maoist posters were found in the spot in which the CPI(Maoists) claimed that the victims were punished for being police informers. 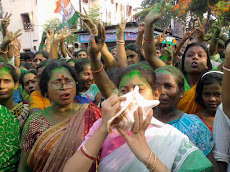 Singh has been admitted to Midnapore Medical College Hospital. BSS, Dhaka, 26 April : The visiting Malaysian business delegation today expressed keen interest to invest in communication, telecommunication and power sectors in Bangladesh. They showed the interest at a meeting of the Bangladesh-Malaysia Chamber of Commerce and Industry (BMCCI) held at a local hotel. President of Federation of Bangladesh Chambers of Commerce and Industry (FBCCI) Annisul Haque and BMCCI President Syed Moazzem Hossain addressed the meeting, among others. The FBCCI president highlighted the present investment opportunities and incentives offered by the Bangladesh government. He urged the Malaysian investors to come forward to invest in the infrastructure development sector in Bangladesh. The eight-member Malaysian business mission arrived in the city earlier in the day on a three-day visit to explore the possibilities of business opportunities in infrastructure development and related services including construction of rail line, roads, highways and bridges. 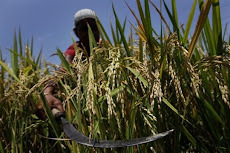 PTI, Haflong, 26 April : Normal life was partially affected in Assam's North Cachar Hills district following a 24-hour bandh called by the NC Hills Indigenous Women Forum (NCIWF). Official sources said there was no untoward incident from any part of the district so far but security has been tightened and a strict vigil was being maintained. 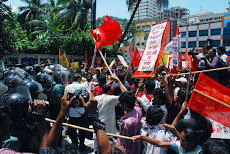 The bandh has been called by the NCIWF to protest against police firing on bandh supporters here on 9 April in which five supporters, including a woman, were injured. The 9 April bandh was called to demand bifurcation of NC Hills district into two autonomous districts following its renaming as Dima Hasao district. 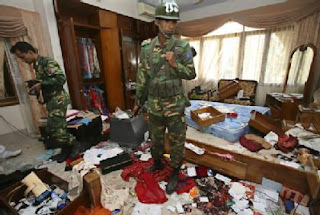 Dhaka, 26 April : Thirty of the mutineers identified as to be involved in Pilkhana carnage belong to 44 Rifles Battalion, Prosecutor Lt Col Kazi Aniruddha told the BDR Special Court-5 on Monday. 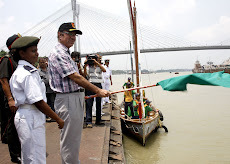 Sepoy Selim Reza played the key role when a group of mutineers entered the Darbar Hall to kill the BDR high officials, including the then director general, on 25 February last year, he added. The three-member court, led by BDR DG Major General Md Mainul Islam, started the trial proceedings at Pilkhana Darbar Hall of BDR headquarters. The special court asked the authority concerned to haul all the 675 accused of the battalion before the court on Tuesday when the trial proceedings resume. The prosecutor said the mastermind of the massacre was the BDR personnel belong to the 44 Rifles Battalion. From deputy assistant director to ordinary jawans were involved in the killings, he added. 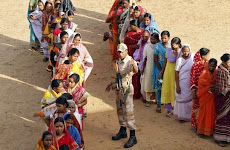 Of the accused, 189 BDR personnel were present at the Darbar Hall during the 25 February carnage, the prosecutor said. Subedar Md Ismail Hossain of the battalion filed a case against 675 BDR men with the special court after the court proceedings began on Monday. Agartala, 26 April : Two insurgents of outlawed All Tripura Tiger Force (ATTF) have surrendered and deposited arms and ammunition in West Tripura district, police said on Monday. Barun Debbarma and Nirmal Debbarma, who fled from their base camps in neighbouring Bangladesh surrendered to the police in Khowai sub-division Sunday and deposited one revolver and some cartridges. 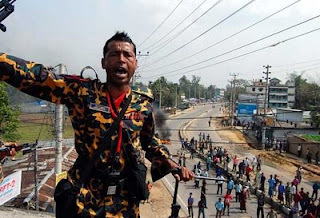 The surrendered insurgents, during interrogation, told police that there has been large scale desertion of the insurgents in the past year due to raids by Bangladesh security forces and non-payment of wages by the insurgent leaders. 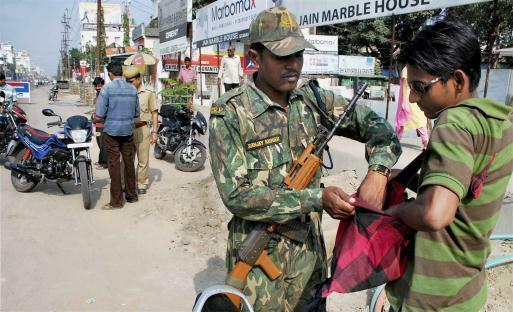 Since January last year, about 400 insurgents of two banned outfits, ATTF and National Liberation Front of Tripura (NLFT), have surrendered to security forces in the state. 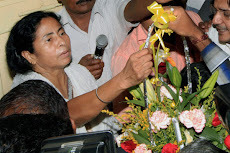 Tarakeswar, 25 April : Railway minister Mamata Banerjee has defended the expenditure in advertisments for organising railway programmes and pilloried the CPI(M) for trying to make an issue out of it. 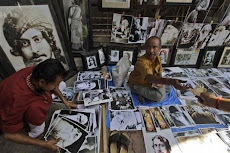 "We have every right to advertise. You (CPI-M) publish advertisements without doing any work. 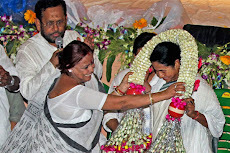 You are angry with us because we work," Banerjee said at the inauguration of a new railway line between this pilgrim town and Talpur in Hooghly district. 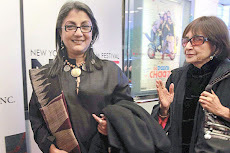 She said Indian Railways had taken up a large number of projects, many of which had been completed and that was why the railway published its success stories through advertisements. 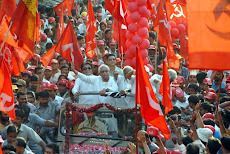 Banerjee said the Left Front government had published advertisements in newspapers claiming successful implementation of projects which were far from complete. 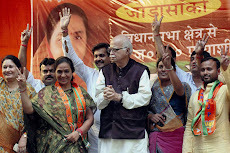 "We are part and parcel of the UPA and will keep on working. 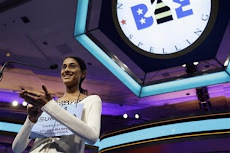 If necessary I will provide clarifications on the expenses," she said at the function on Sunday. 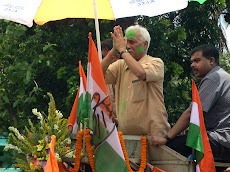 The project had been started during Banerjee's earlier stint as railway minister in the NDA government. She said when she took over the Railways again in 2009 she learnt that it had made little progress. 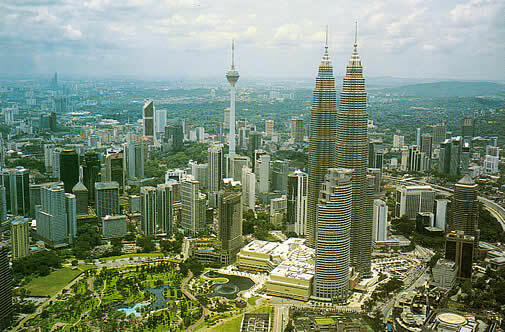 Dhaka, 25 April : A high-profile Malaysian trade delegation arrives in Dhaka Monday to explore investment opportunities in Bangladesh. 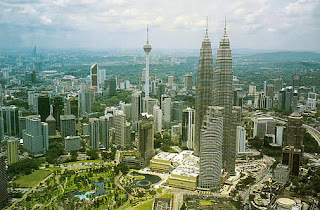 Officials said the delegation comprising members of the Construction Industry Development Board of Malaysia (CIDB) will call on communications minister and meet leaders of Federation of Chambers of Commerce and Industry and Real Estate and Housing Association of Bangladesh during their three-day visit. They said the delegation members will study the possibility of investment in the country’s roads, rail and highways, including expressways, real estate and telecom sectors, the officials added. “We expect investment proposals in telecom service sector, elevated expressway, highway operation including toll plaza,” said Momtazul Islam, secretary of Bangladesh Malaysia Chamber of Commerce and Industry (BMCCI). 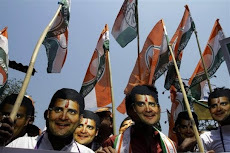 PTI, New Delhi, 25 April : In the wake of a two-day bandh call given by Maoists in three states from tomorrow, Railways have decided to restrict speed of flagship Rajdhani express besides cancelling and diverting some other trains passing through or originating out of these states. 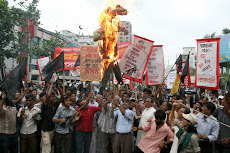 The left-wing extremists have called a shutdown in West Bengal, Bihar and Jharkhand on 26 and 27 April. During these period, all the Rajdhani express trains passing through Bihar and Jharkhand will run at a restricted speed of 75 kmph during night hours instead of their original speed of 110-120 kmph, said sources in Railways. 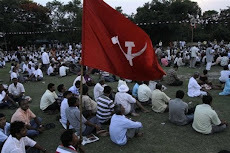 IANS, Kolkata, 25 April : Two CPI(M) leaders were killed by Maoists in Bankura and West Midnapore districts on Sunday, police said. A police officer said the body of Parmeshwar Murmu was found near his house in the Ranibandh Police station area. 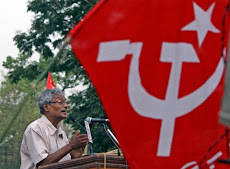 Murmu, a member of CPI(M)’s Jamagoria local committee, was abducted by a group of armed Maoists Saturday night from his house. 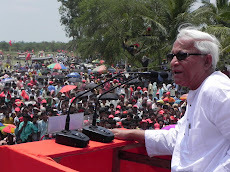 The body of another CPI(M) leader Sisuranjan Mahato, who was taken captive from his house at Dhangasole village of West Midnapore district Saturday night, was also found at Mirgan close to Salboni police station. "Around 10 Maoists barged into Mahato’s house last night and took him away. His body, with multiple injury marks, was found four km away at Mirgan today" said another police officer. 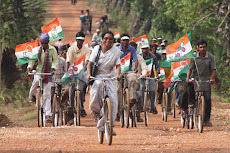 The Maoists have been active in the state’s three western districts of Bankura, Purulia and West Midnapore. Siliguri, 25 April : Three motorcycle-borne persons were killed after being hit by a train at an unmanned railway crossing at Sahudangi Canal Mor near here, this afternoon, police said. The three, all in their early 20s, were on their way to Chelibari Mor when they were hit by the New Jalpaiguri-bound Haldibari Express. Two of them were flung into a canal, police said, adding one came below the wheels of the speeding train. 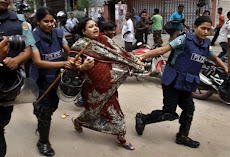 Dhaka, 25 April : Charges will be pressed within May against some identified persons allegedly involved in the crimes against humanity during the Liberation War, Bangladesh Law Minister Shafique Ahmed said on Sunday. The minister also said the probe team collected data and information about some perpetrators of crimes against humanity. He said this to reporters at the secretariat after an inter-ministerial meeting on coordination between the investigation and prosecution teams dealing with the war crimes trial. A three-member international war crimes tribunal was formed along with a seven-member investigation agency and 12-member prosecution team on 25 March for trying the crimes against humanity. The law minister, however, did not disclose the names of the persons against whom the charges will be pressed. He said investigation will continue against other war criminal suspects after submitting charge sheets against the identified persons. A list of criminals will be published through a notification after the investigation, Shafique added. 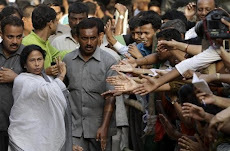 Kolkata, 25 April : At least 75,000 part-time schoolteachers in West Bengal will now have a permanent job with the state deciding to create a new education board. The proposed board will come into effect on 1 July. These teachers, appointed under the panchayat department’s Sarva Shiksha Abhiyan (SSA), will now have a renewable five-year contract instead of the annual contract. They will also get a 35 per cent salary hike. “The SSA teachers have been made permanent. 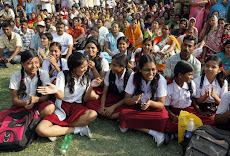 All schools under the new board will have a different status,” state Panchayat and Rural Development Minister Anisur Rahman told Bengal Newz today. PTI, Imphal, 25 April : Suspected militants placed a powerful grenade this morning at the residence of a Manipur government official. Sources said family members of executive engineer of irrigation department Keisam Roni found the grenade at around 5.30 am at their complex at Tera area in Imphal West district. Family members immediately reported the matter to the police whose bomb experts defused it, sources said. 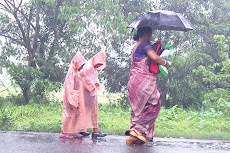 PTI, Guwahati, 25 April : At least Nine persons were killed and 50 injured as thunderstorm lashed many parts of Assam. 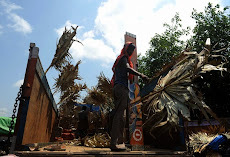 Two persons died at Vetapara area here when their thatched house collapse in the storm last night. Heavy rain and thunderstorm uprooted trees and electric poles as traffic on most parts of the national highway came to a halt for more than two hours from 8 pm last night. According to official sources, five persons in Sonitpur, Darrang and Goalpara died when they were hit by lighting. 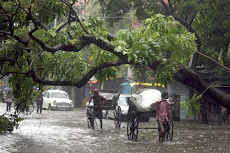 The worst affected districts include Kamrup (Metro), Kamrup (Rural), Dhubri, Goalpara, Nalbari and Barpeta, they said. Rangamati, 25 April : Two people were killed by lightning during a nor'wester that swept over different parts of Ramgarh upazila in Khagrachhari Sunday morning. 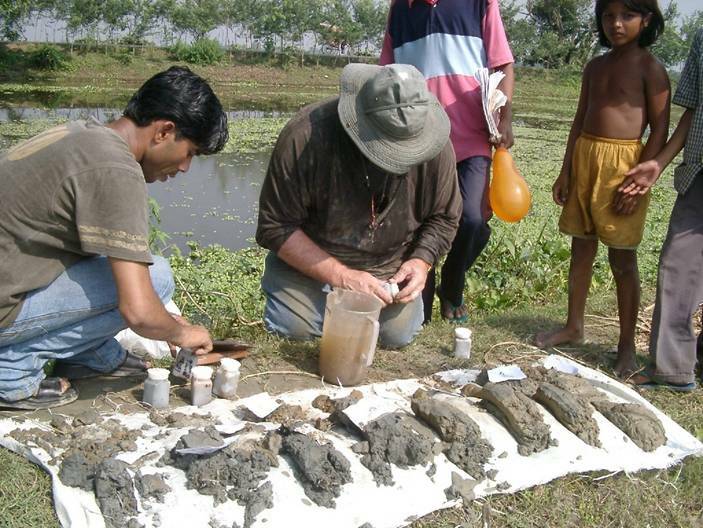 BSS, Dhaka, 25 April : About two crore people are still drinking arsenic-contaminated water in Bangladesh, while only 53 percent of its population has access to improved sanitation facilities. 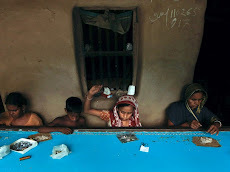 However, the practice of open defecation has been significantly reduced to 7 per cent from 33 per cent in 1990, Unicef said here yesterday on the occasion of the first annual high-level meeting of a new global partnership, Sanitation and Water for All, that began in Washington the same day. 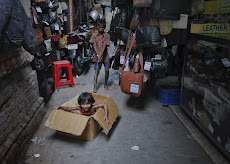 It also said at least 2.5 billion cases of diarrhoea occur in children under five years of age every year in the world and an estimated 1.5 million children die from it annually. 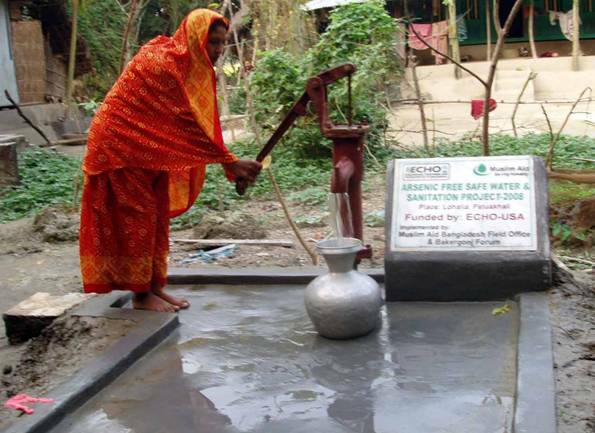 "Huge savings in health care costs and gains in productive days can be realized by improving access to safe water, sanitation and hygiene - amounting to some 2% to over 7% of gross domestic product, depending on the region," the UNICEF said in a release issued simultaneously from Washington and Dhaka. 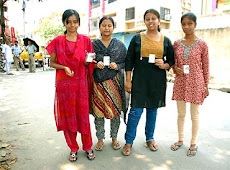 Kolkata, 24 April : A five-member expedition team from Nadia districts Krishnanagar attempting to climb Mount Everest is progressing well on their target, surviving the initial hiccups caused by changing of route from China to Nepal after visa refusal by the former. According to a message received from the expedition leader Basanta Singha Roy Friday, the team has reached camp one at an altitude of around 20,000 feet beyond Khumbu Icefall on 21 April. The expedition , organized by Mountaineers Association of Krishnanagar (MAK), earlier set up their base camp on Khumbu glacier at an altitude of about 16,000 feet after seven days’ trek from Lukla where they arrived from Kathmandu by air. 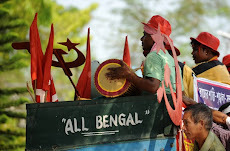 Bolpur, Kolkata, 24 April : One person was killed in clashes between CPI(M) and Trinamool Congress supporters at a number of villages in Birbhum district today. Birbhum Superintendent of Police Rabindranath Mukherjee said bombs were hurled by the rival sides and a few hundred thatched houses were set ablaze in Jalangi, Palundi, Thuksara and Shepur villages since morning. 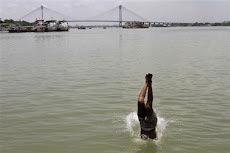 The SP said that he had heard that one person had been killed, but the body was yet to be recovered. 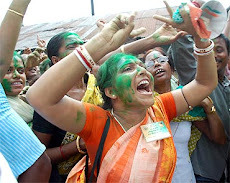 Trinamool Congress sources said that a supporter, Chottu Sheikh, was killed in Sherpur village. Rapid Action Force have been deployed in the villages, the SP added. UNB, Dhaka, 24 April : Bangladesh Prime Minister Sheikh Hasina leaves here for Bhutan on 27 April to attend the 16th South Asian Association for Regional Cooperation (SAARC) summit in Thimpu. The two-day summit with “Climate Change” as its theme will begin on 28 April. This is for the first time the landlocked Bhutan is hosting the SAARC Summit. With the holding of the summit, Bhutan will assume the Saarc chair of the eight-member regional forum representing Afghanistan, Bangladesh, Bhutan, India, Sri Lanka, Nepal, the Maldives and Pakistan. Kolkata 24 April : CBI Director Ashwini Kumar today said he was hopeful of securing the extradition of Danish national Kim Davy, the main accused in 1995 Purulia Armsdrop case. Noting that efforts were being made since 2002 for Davy's extradition from Denmark, he said the Danish government has now agreed to send him to India. Pointing out that Davy has filed an application against his extradition in Denmark, he said, "as the judicial process in Denmark is not lengthy, we think we will be able to get him here in the near future. "But, it is true that the entire process will not be an easy one," Kumar said inaugurating a training module for press correspondents here. The case relates to the airdropping of a huge cache of arms and ammunition from an AN-26 aircraft in Purulia district in December 1995. 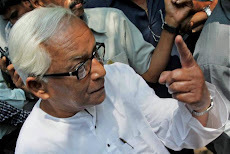 Dhaka, 24 April : Awami League leader Suranjit Sengupta on Saturday said Bangladesh government is considering to formulate a law to protect witnesses, who will give depositions during the trial to prove the offences committed by the war criminals. He was speaking at a discussion on “Trial of War Crimes and Rehabilitations of War Criminals” organised by Bangabandhu Academy at Dhaka Reporters’ Unity auditorium in the morning. While speaking on the occasion, State Minister for Home Shamsul Haq Tuku urged all to resist the war criminals socially and politically. Baharampur, 24 April : Fourteen persons were injured when bombs exploded in a private bus at Basudebpur on the National Highway 34 in Murshidabad district on Saturday, police said. The bombs kept in a bag under the rear seat exploded when a passenger accidentally stepped on it when the driver applied the brakes to avoid a lorry, they said. 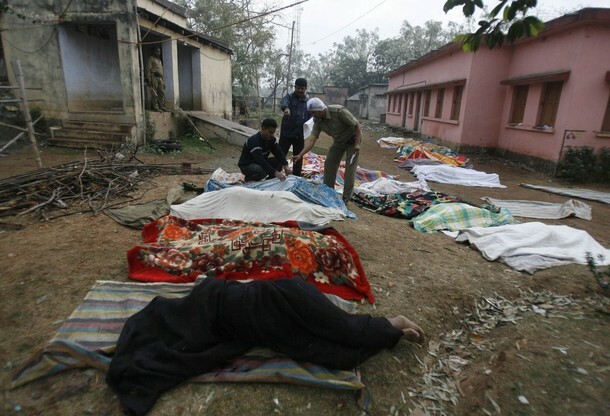 The condition of nine of the injured at Jangipur hospital was stated to be serious. The remaining passengers were admitted to other hospitals. 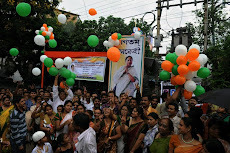 The bus was going from Shamshergunj to Chanchol in neighbouring Malda district. UNB, Chuadanga, 24 April : Indian Border Security Force (BSF) kidnapped a Bangladeshi young man from Baradi border in Damurhuda upazila on Saturday. BSF jawans of Gede camp kidnapped Shaheen Alam at about 7am(BDST) when he went there for grazing cattle. 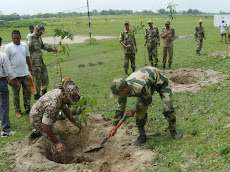 Later, BDR jawans held an Indian national, Shuvankar, on chare of illegal infiltration. Local BDR authorities sent a letter to BSF authorities protesting the abduction of Bangladeshi and demanding his return immediately. The incident created tension along the border. Amitava Banerjee, Darjeeling, 24 April : The joy ride service from Darjeeling to Ghoom has become irregular because of the sub-standard coal supplied by Coal India Ltd. In the past five days, the service had to be cancelled twice. The 16-km round trip needs 600 kg of coal. “The Darjeeling train will be supplied the grade (of coal) it requires. 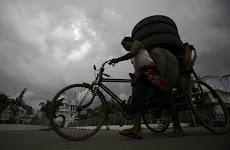 The problem will be sorted out,” Coal India Chairman Partha Sarathi Bhattacharyya said. 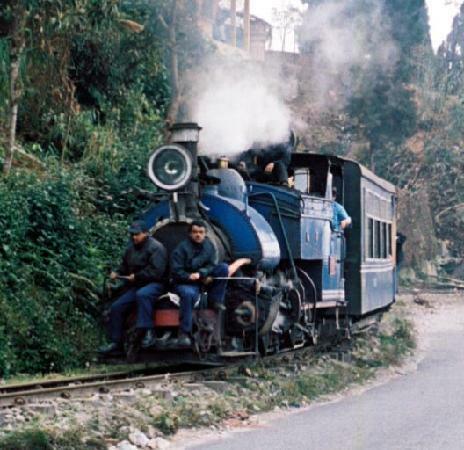 A two-bogie train carries 44 passengers for 8 km from Darjeeling town (6,710 feet) to Ghoom (7,400 feet) and back in a ride that exudes old-world charm - a puffing steam engine and its traditional whistle. There are two round trips a day. The coal often fails to generate adequate steam after a journey starts. On Thursday afternoon, the trip was cancelled after the passengers waited for three hours. Steam engines are used for these rides, which are a favourite with tourists. 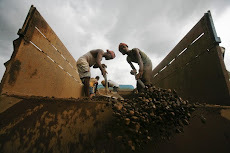 “As coal can’t be purchased locally, there is very little we can do except wait for the next consignment, which we hope will be of good quality. 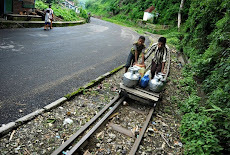 The new consignment is expected to arrive only after 20 days,” said P. P. Roy, director, Darjeeling Himalayan Railway. Darjeeling Himalayan Railway was accorded world heritage site status by the United Nations Scientific and Cultural Organisation in 2000. 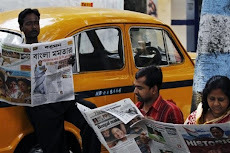 Dhaka, 24 April : Zahirul Ahsan Tipu, news editor of the Bhorer Kagoj, a Bangla daily, passed away due to a cardiac arrest at a city hospital in the early hours of today at the age of 47. 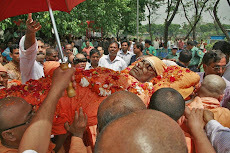 He left behind his mother, wife, a son, a daughter and a host of relatives and well-wishers to mourn his death. Tipu had also worked with the daily Amader Shomoy, daily Shamokal and the daily Destiny.